As we drove home from the Grand Canyon, through the Great Basin desert, I had plenty of time to reflect on the past year, particularly the last four months, and how my crazy idea of the Grand Advenchair had affected not only me and my family, but a much greater circle of people as well. This trip started out as a way to challenge myself and team both physically and mentally in a beautiful, yet demanding place, but clearly was much more. It wasn’t just about me. We all challenged and stretched ourselves. A group of family and friends rose to the task, training on local trails and upgrading and modifying my wheelchair. The preparations were honestly as rewarding as the trip itself with lots of brain-storming, evaluation, testing, modifications, and re-testing. The time on the trail required team work, cooperation, and communication. We are literally writing the manual on how to build and operate a wheelchair on rugged trails. We’ve not only beefed up the wheelchair and made it more ergonomically efficient to pull, push, and maneuver, but also created a system for working as a team to reach difficult places. We’ve created something akin to mountain biking and mountaineering. Had we not actually gone to the Grand Canyon the six training days and time spent modifying the AdvenChair itself made for a hugely successful summer. Breaking down on the trail exposed a critical weak spot in the chair but at the same time confirmed the strength, resilience, and determination of the team. Ahead of the trip Chris Biggs from Central Oregon Daily interviewed me on our last training hike. She did an excellent job of telling my story and motivation for this trip. Thank you Chris! ​In prior blogs I wrote about the team and greater community that have grown from this idea. 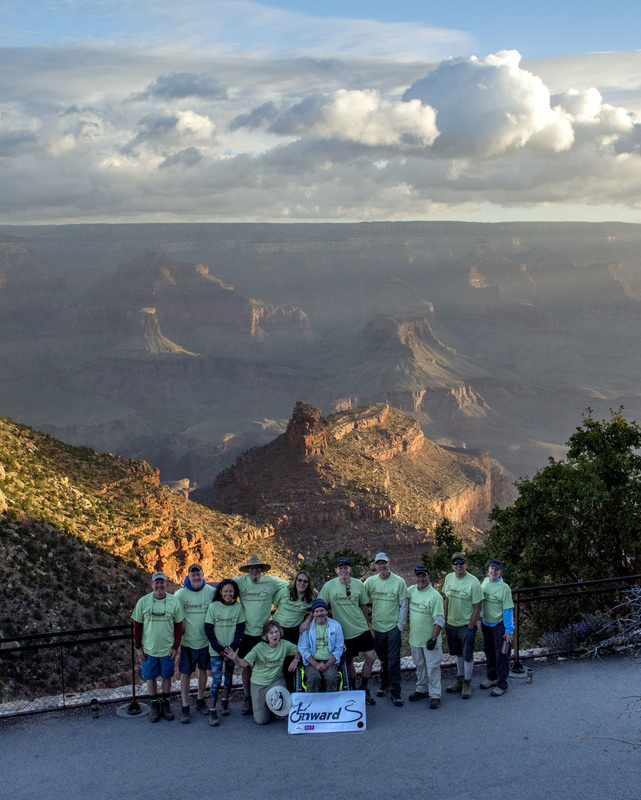 The “team” consists of not just those of us who ventured into the Grand Canyon, but also some key individuals who worked on the chair or helped us prepare for the trip. The immediate “community” is those people, businesses, and organizations that supported and encouraged us with donations of money or goods, or shared help and advice. The greater community is perhaps the one we really hadn’t expected. They are the ones that we met in the campground or along the trail. Or the people that told us how inspiring it was to see a wheelchair on the trail. Or the people that carried our packs and the broken wheelchair up the hill. Or the campground neighbors with a disabled son who called us “heroes”. It made us all feel good to know that we had touched others. No doubt it was really disappointing to have to admit defeat and get help back up the hill. But it really wasn’t defeat because we DID make it 2 miles into the canyon, our contingency plan DID work, the team responded to the challenge incredibly well, no one got hurt, we all learned a lot and had a great time. It’s hard to have a bad day in an incredible place with great people. We all left with very positive memories and a desire to complete the trip. Dale and Susie Neubauer of Blue Moon Designs couldn’t make the trip but were (are) vital parts of the Onward Project. Dale is a helicopter mechanic with meticulous attention to safety and detail. Building the bomb-proof AdvenChair seemingly has become his mission. Susie has supported us all along, but without her help packing and organizing we wouldn’t have got on the road in time. Dave Taylor from NuMotion and Gary Crosswhite with Sagebrush Cycles provided important wheelchair and bike parts, tinkering, and advice. Dave Zimmerman designed workouts to prepare me for the canyon, and with Brian Tandy, were regular members of the Pilot Butte training group. Fourteen of us traveled to Arizona. Recent foot surgery prevented Barb Scott from going into the canyon but she filled the vital role of Base Camp Manager, creating menus and shopping lists and maintaining order in camp. Amy Kazmier used her Helitack firefighting experience as our Load Master, coordinating between the team and the mule wranglers to organize and load the 26 duffels that carried our food and gear down into the canyon and back out. She was also a great traveling companion for our long road trip. Oregon Adaptive Sports was instrumental by supporting Pat Addabbo and Matt Eitel to be part of the Grand Advenchair. Besides many great pictures, Pat has provided important insight and leadership throughout the whole process. Matt’s strength and mechanical skills were key, but his laugh was huge! Tom Zell did all of the pre-trip grocery shopping and was a fountain of knowledge about Grand Canyon history and lore. Heicke Williams was always steady and cheerful but it was her Native American wisdom with a German accent that we’ll remember the most. Matt Eschelbach joined us late, adding strength, humor, and the peace of mind that comes with having an emergency room doctor on the team. Adam Peterson was with me in 2010 when we looked over the rim and agreed that someday we would go down into the canyon. We really appreciated his strength, calmness, and mechanical skills. Patty Caballero packed a lot of enthusiasm and energy into a small package, giving us both physical and emotional boosts when we needed it. Dennis Fiore has been with us on many other AdvenChair trips and he always has great experience and insight to share. I’m proud of my sons Cory and Emory, especially for their leadership when we broke down and needed to switch our thinking from going down to getting me and the chair back uphill. Cory worked confidently with the other mechanics to devise a creative repair and Emory organized the climbing team and made sure I had a tarp over-head for the impending storm. And I’m most grateful to my wife Yvonne, for without her support and energy I couldn’t even imagine things like the Grand Advenchair. ​The trail may have broken the chair but it only strengthened our team and community. Whether from the team, park rangers or hikers on the trail, or folks we met along the way, the comments were all about “next time”. Now that we know the weak point in the system we’ll keep working on the bomb-proof wheel chair and we’ll be back. Onward! Photo credits: Pat Addabbo, Cory Babb, Emory Babb, Yvonne Babb, Patty Caballero, Matt Eschelbach, Dennis Fiore, Amy Kazmier, Barb Scott, and Heicke Williams. It was a Grand Advenchair Indeed! Amy, Yvonne, and I arrived back in Bend tonight after 3 days of driving from the Grand Canyon, exhausted but excited (most everyone else flew home Friday). I wanted to write a quick update, and then it’s off to a shower and bed. Despite our extensive prep and training, the infamous Bright Angel trail water bars may have broken the axle on my wheelchair at around 2 miles into the canyon but it brought out the best of us. I wasn’t hurt, it wasn’t an emergency, and team worked wonderfully to do a field repair and get me back up to the rim. My time on that trail was over but 8 of our 13 team members did make it down to Bright Angel campground and spend a night before climbing back out. Between pulls on the whiskey bottle, the campfire conversation on our last night centered around building the bomb-proof expedition chair and planning our next trip to the Big Ditch. I’ll share more stories and pictures soon, but in the meantime, thank you for all of your support!